The ultimate convenience food, eggs are powerhouses of nutrition, packed with protein and a range of 18 vitamins and minerals. Almost all eggs are edible but the most commonly consumed are hen’s eggs. Bantam, quail, duck and goose eggs are also readily available and vary in size and flavour. One of the favorite meals for breakfast in the world is eggs prepared in various ways. Not only are eggs easy to prepare, but they are also highly nutritious and healthy. This is why almost all people buy lots of eggs and then store them in the fridge or at room temperature. Nevertheless, recently a debate emerged in some forums about the need for eggs to be refrigerated or not. 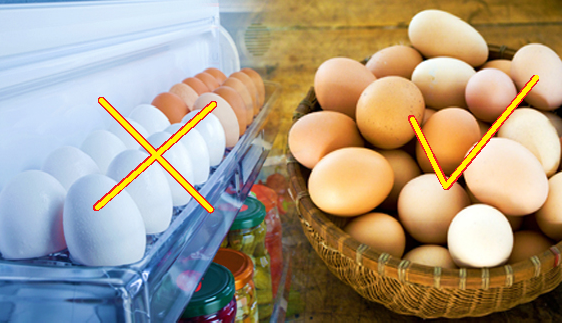 Nevertheless, the National Public Radio states that eggs should not be refrigerated. According to them, in the United States there are numerous measures of protection against salmonella undertaken, including inspections, washing, and tracking of the eggs from the supplier to the stores. In Europe, the majority of chickens are being vaccinated against salmonella, meaning that there is no need for us to worry about this bacterium. As the FDA has reported, vaccines are a pretty efficient component of a Salmonella enteritidis prevention program. Marianne Gravely, a technical information expert at the USDA’s Food Safety and Inspection Service says that eggs should not be kept at a room temperature for more than two hours. As she explains, there is no possibility for us to see if an eggs shell is pathogen-free. Moreover, one of the bad things about these bacteria that cause food poisoning is that they do not impact the taste, the smell, or the appearance of the food. No one can tell if a chicken is infested with salmonella, so it is possible that the eggs, whether they come from a grocery store, a farmer’s market, or the backyard of your neighbor contain salmonella. The final decision is still up to the consumers themselves. All people should be aware how to handle the food they consume, and this can be the best prevention of numerous health problems.